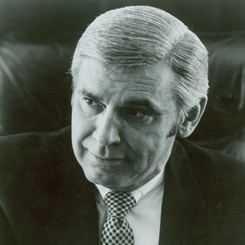 Image, Office of the Clerk, U.S. House of Representatives Representative Leo Ryan of California was postumously awarded the Congressional Gold Medal, Congress’s highest experession of national appreciation for distinguished achievements and contributions. On this date, a delegation led by Congressman Leo Ryan of California was ambushed in the South American country of Guyana leaving five dead including Representative Ryan. The group’s mission was to investigate allegations of abuse at an American settlement of cult leader Jim Jones. The delegation consisted of Representative Ryan, family members of those in the cult, reporters, and Ryan’s staff assistant Jackie Speier. With a reputation as an investigator, Ryan became involved when some of his constituents joined the cult. Jones left California to escape inquiries into his group, the Peoples Temple, and roughly 1,200 Americans followed him into the jungle of Guyana. Following the ambush on Ryan's group, more than 900 members of the cult committed mass suicide in the community known as Jonestown. In a tribute to Ryan on the House Floor, Majority Leader Jim Wright of Texas eulogized him as, “a friend of the disadvantaged, the disenchanted, and the dispossessed—those who most need a friend in high places. He took on their habiliments, tasted their anguish with them, and in their service he went literally to the ends of the Earth.” Five years later, on November 18, 1983, Congress posthumously awarded Representative Ryan the Congressional Gold Medal. Ryan’s staff assistant, Speier, who was wounded but survived, ran in the special election to succeed her boss. She lost the campaign but went on to serve 20 years in the California state legislature before winning a 2008 special election to the U.S. House, succeeding the late Representative Tom Lantos in a Bay Area district.